Sadly, CMYK and RGB aren’t text shorthand for any of the above. They are, however, shorthand for a set of colors they represent. 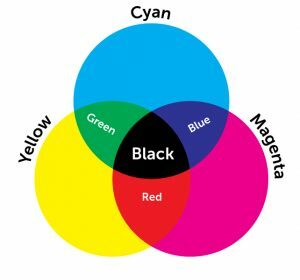 CMYK: Cyan, Magenta, Yellow, Black (yes, that “K” is short for “black”). And, more importantly, why should you care about these acronyms? They are important in determining colors when sending something to the printer or looking at something on a web site. This set of colors are combined when printing at an offset printer. Say you print a brochure. Every color you see in that brochure is made up of tiny, overlapping dots of cyan, magenta, yellow, or black ink. The dots overlap to create what look like little rosettes. We don’t usually perceive these rosettes because they’re so tiny, but we do end up seeing the result, which is the image/the text/the graphic/the brochure. If everything we see in print is made up of tiny little CMYK rosettes, then everything we see on the screen is made up of three light sources: Red, Green, and Blue. On a traditional analog TV (for those of you old enough to remember sitting just inches away from the TV), you could get up close and see the three little light lines of RGB that made up the image you were seeing. Combine all three colors and you get white light. You take a digital photo and it will be in RGB color mode, made up of red, green, and blue colors. You then look at it on your computer monitor. It’s still in RGB color mode. Only by manually converting it to CMYK will the image be in CMYK, which is the appropriate way to send it to your printer. Some printers will convert files for you, but be aware that your file may not look the same as what you saw on the screen. Always look at a proof print. Also, most online print services will not convert files for you or will charge for the service. Ask your printer first before sending non-coverted files. When a printer is printing your documents, you can have more than these four CMYK colors. They are called “spot” colors. The most commonly known spot colors are Pantone (PMS) colors. These colors are specially mixed and are applied separately to the paper from the other four colors. Spot colors will provide very accurate printing results, but will add to the cost of your printed document. Your monitor will never 100% accurately portray CMYK colors because it is trying to render CMYK using RGB light. If you are going to be preparing quite a bit of print documentation, and exact color matching is important, invest in a color calibration system for your monitor. It will help your monitor more accurately represent CMYK colors on an RGB monitor.